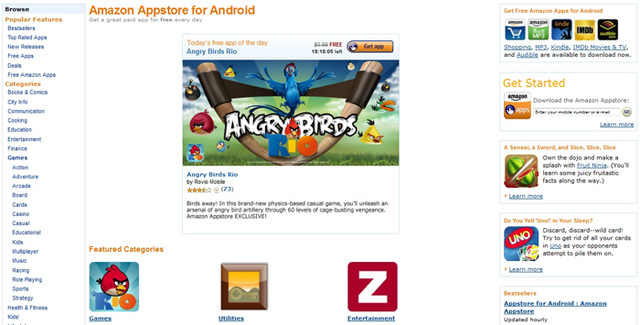 Amazon has also comes into a market with its own AppStore after Andoird and Apple stores. 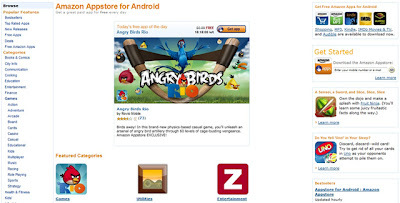 Amazon AppStore will more attract those audiences who regularly shops at Amazon's portals. The AppStore looks familiar with apps divided into logical categories, best seller, paid and free sections. Pages for individual apps are laid out in a similar manner to any other product on Amazon, with screenshots, ratings and product descriptions all present and accounted for. Amazon will also screen every app before allowing it to appear on the Appstore, an approach far closer to that taken by Apple and a definite step away from the relatively open submission process for the Android Market. In terms of design, it will largely come down to individual taste, but to this writer the Amazon Appstore appeared much cleaner and easier to navigate than Google's ''native'' offering. For the next 19 hours, visitors to the store will be greeted with a free copy of Angry Birds Rio, the much-hyped, movie-themed, Amazon-exclusive version of the popular mobile game. For those of you on the Apple side of the fence, the game also launched today on iOS. Amazon will offer one paid app for free each day. Purchasing apps requires the installation of the Amazon Appstore app on your device, as well as an Amazon account. Users will also need to follow a few simple steps to enable apps to be installed from ''unknown sources''. Checkout is handled using the company's existing payment infrastructure. The need to install an app before making purchases on the Appstore would seem to contradict a report last month that apps would be able to be purchased from Amazon's store without an Android device and installed at a later date. If Amazon can leverage its brand power to get its app store onto Android devices, Google's offering could be in serious trouble, though at present the search giant has the distinct advantage of being the only app store installed by default on every Android phone. It's highly likely Amazon is working feverishly behind the scenes to change that situation. 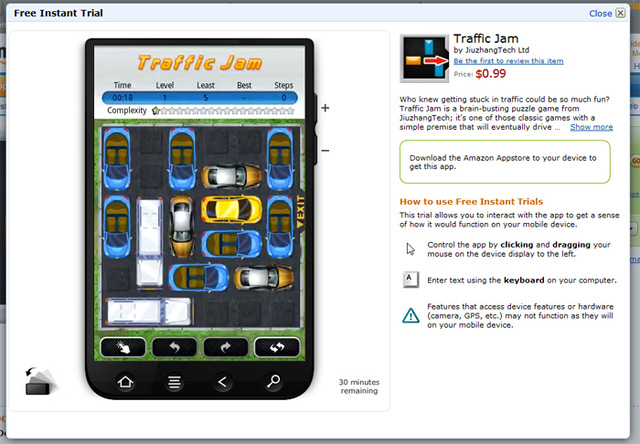 You can check and visit Amazon AppStore live here.